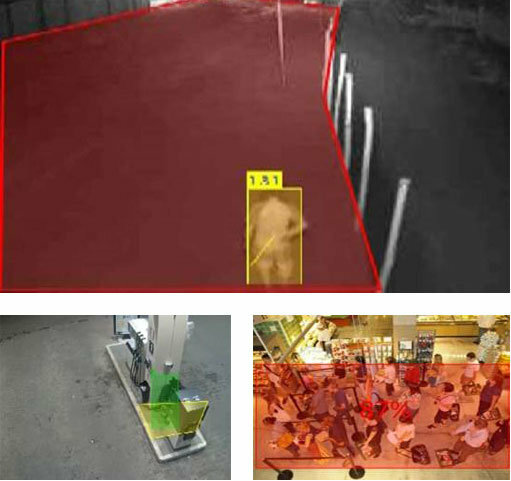 The utilizability and performance of the MULTIEYE video systems are massively increades by the broad range of MULTIEYE VCA Video Analytics Modules.� Its precise technology allows its users to recognize, analyze and react very quickly. This makes MULTIEYE a highly effective modular monitoring and recording system for security and business intelligence applications and offers unequaled opportunities. MULTIEYE systems with VCA Video Analytics increase the security staff's productivity by targeted event-related alarm. The system minimizes false alarms and reduces information transfer data. Furthermore the video analytics system recognizes and signals then threshold values are exceeded or not reached. With 27 different analytics functions you will find the right tool which meets your needs. In addition to the individual modules we offer application-specific packages consisting of a combination of tools, e.g. for car park and traffic surveillance, object tracking, ATM / cash machine monitoring and other special monitoring requirements. Monitoring and analysis of security controlled areas in airports, railway stations, public buildings, public places, etc. Detection of abandoned or left objects. Search for missing / lost objects and items.